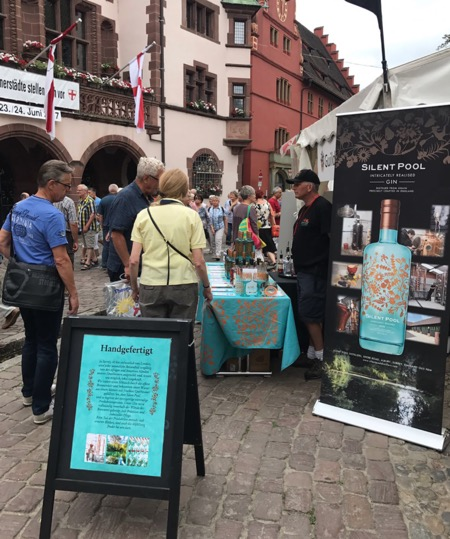 Silent Pool Distillery flew the flag for Guildford’s dynamic entrepreneurial spirit at an international market in Germany last weekend. The two year-old company was invited by Freiburg, Guildford’s twin town, to come to its biennial ‘Sister Cities’ Market, where representatives from its other nine ‘twins’ - Besançon, Innsbruck, Padua, Madison USA, Matsuyama, Lviv, Granada, Isfahan and Suwon, also had stands promoting their local specialities. Guildford is one of Freiburg’s longest running twin towns. They linked nearly 40 years ago and it was through the 2016 Mayor of Guildford, Gordon Jackson, that Silent Pool Gin found its way onto the stall in the historic market square. He had taken a bottle of Silent Pool Gin as a gift for his opposite number on an earlier visit to Freiburg and it proved a popular choice! The Guildford Twinning Committee volunteers served tea and cakes and Silent Pool Distillery director Ian McCulloch and chief bottler Joe Van den Berg presided over a Silent Pool stall laden with their full range of spirits. They even took the trouble to get all their branding and information translated into German for the occasion! The Silent Pool Distillers is a new artisan distillery nestled under the North Downs in Albury, Surrey. It specializes in entirely hand-crafted spirits using a range of botanicals – fruits, flowers, spices, herbs – to capture the essence of the Surrey Hills Area of Outstanding Natural Beauty and the bounty of English orchards, gardens and hedgerows. Silent Pool Gin is now exported across Europe and soon to the US, as well as available nationally and at local farmer’s markets. Guildford House Gallery. A touring exhibition in Guildford from Leicestershire County Council Museum Service. Frank Brangwyn (1867-1956) was a famous international artist when the First World War broke out. 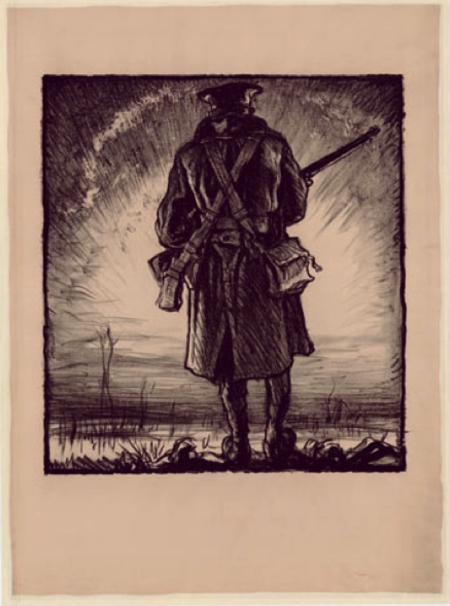 A self made artist and designer with no formal academic training, Brangwyn was well aware of the power of printed images to influence public opinion, and felt it was his patriotic duty to use his art on behalf of the war effort. 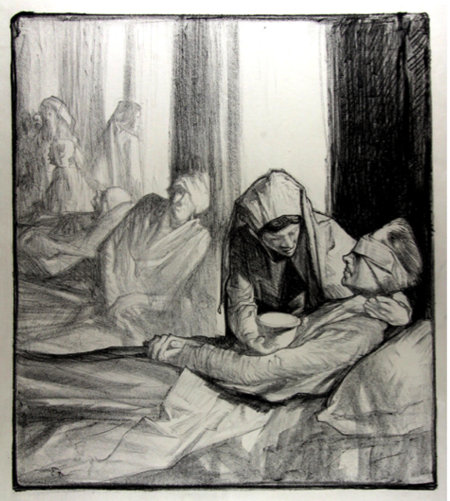 Although not an official war artist Brangwyn produced over 80 lithographs and posters during the First World War, which included images of the machinery of war, the non military involvement in the war effort, and rehabilitation of injured servicemen. Born in Belgium he identified with its people and the destruction of the country at the start of the war. Brangwyn’s first poster Britain’s Call to Arms showed the reality of war in all its horror to the unsuspecting British public. The poster, which was displayed on the London Underground system inspired men to enlist in huge numbers. However the War Office, concerned by the graphic nature of the image asked Frank Pick, the commercial manager of the London Underground, to remove it from underground stations. They later relented and the poster continued to be used for recruitment during the early stages of the war. This exhibition contains a selection of twenty imposing posters. These stark monochrome images show a glimpse of what life was like for many people during the war. For further details call 01483 444751 or email heritageservices@guildford.gov.uk Exhibition entry is free. 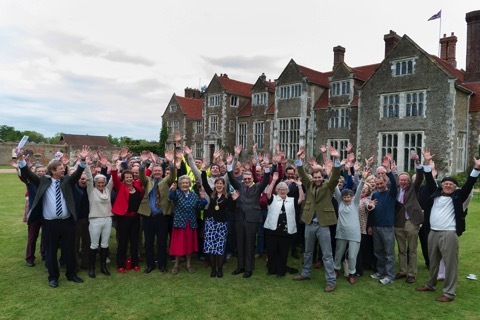 On Friday May 15 Loseley Park celebrated the completion of its new roof – the first complete re-roofing in nearly 160 years. 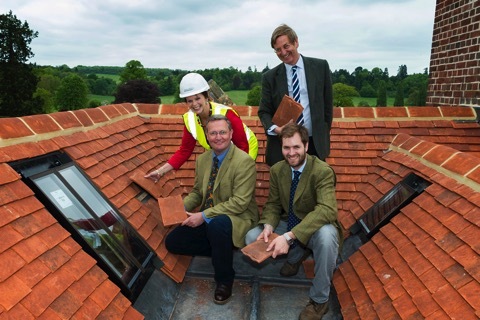 90,000 deep orange tiles have replaced the old slate and a party of 60 attended the event, including The Mayor of Guildford, Nikki Nelson-Smith, and Anne Milton, MP for Guildford. The work started at the end of September, using 550 tons of scaffolding soaring 100 foot high and stretching 200 feet across the whole of the House. The event takes place on a closed public road in the Surrey Hills, four miles from Guildford. Although only in its third year it’s already become one for the diary for anyone with the slightest interest in cars. The organisers are looking for interesting cars that you rarely see on the roads these days, they don’t necessarily need to be valuable The car and driver must be road legal but no competition licence or preparation is required. There are only 135 spaces available, last year’s entry was heavily oversubscribed with many rare and exotic cars, ranging from a 1907 aero engine Berliet to a bright green two week old Lamborghini Aventador. You can get the flavour of the event from the videos and photos of previous years posted on their web site. The hill climb course ascends by 300 feet over a distance of nearly a mile with a series of challenging corners along the route. There are panoramic views across the Surrey countryside, London and the Wembley Arch can be seen in the distance. Around four thousand spectators are expected, so if you don’t fancy taking part but would like to watch the action, the event kicks off at 9.30am. The event raises money for seven local charities. Last year, the event raised an impressive £13,000, the organisers hope to beat that figure this year. Hilton Riverside Secret Wedding Fair.